Offering a plush accommodation in a serene environment at Plot 123 Cadastral Zone A0, Cadastral zone, central business district, Abuja. Chelsea Hotel is an exquisitely furnished hotel in proximity to International Conference Center and Arts & Crafts village. It boasts facilities like a tennis court, swimming pool, gym and well-furnished rooms. Free Wi-Fi is available on the premises. 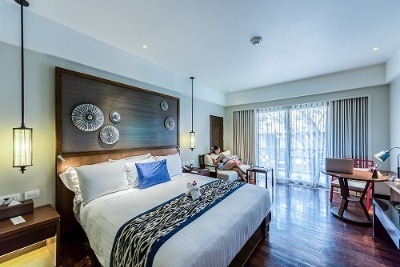 Each room is tastefully furnished with a king-sized bed, air conditioner, sofa, flat screen TV with local and international channels, refrigerator, ornate lampshade, wardrobe, tea/coffee making facilities, soft sofas and an en-suite bathroom with complimentary toiletries. The rooms are categorised into Presidential Suite, Ambassadorial, Junior Suite, Panoramic, Deluxe, Superior, Regal and Executive Rooms. Some exclusive rooms have a separate living area. The restaurant in Chelsea Hotel provides guests with an extensive menu of both Local Nigerian and International dishes. Guests can enjoy a variety of cocktails and drinks while relaxing at the bar/lounge. Complimentary breakfast is available on the buffet and menu option. Guests can enjoy a relaxing dip in the swimming pool and also enjoy exercise sessions in the fitness centre. The hotel hosts Jazz night and Nigerian Night with the live band. The meeting room can be booked for small corporate gathering. Laundry, car hire, airport shuttle, and concierge are additional services offered at a surcharge fee. On-site parking space is available. Maximum security is guaranteed. Children- kids are welcome to stay at no extra cost. Q: Does Chelsea Hotel offer special diet meals? A: Yes, special diets are available on request. Q: Does Chelsea Hotel have designated smoking areas? A: Yes, there are designated smoking areas. Q: Does Chelsea Hotel offer free parking space? A: Yes, on-site parking is free. Q: Does Chelsea Hotel offer free internet access? A: Yes, there is free WiFi in all areas. Q: Does Chelsea Hotel serve complimentary breakfast? A: Yes, complimentary breakfast is served to all checked-in guests. Chelsea Hotel (Central Business District) is a top-class hotel in Central Business District , Abuja. I quite enjoyed my stay at the hotel. I did not exactly have any issues checking in and out of the hotel. I have no complaints whatsoever about the place. The services rendered were good and the staff were very efficient while carrying out their duties. Good, excellent and fine hotel. I would give an eight over ten rating so that there can be room for improvement. Check in time is too slow. Too much waiting in the lobby. My stay at the hotel was just okay. I did not really enjoy the hotel though because it was not up to my taste but it is nothing to worry about. The place is just okay. The management can work towards making it better. Have nice pictures of Chelsea Hotel (Central Business District) ?